In an exciting finish to the 7th annual USA Hockey Sled Classic presented by the NHL, Pittsburgh’s Mighty Penguins Senior team was crowned Tier 2 Champs, defeating Keystone State rivals, the Philadelphia Flyers, 7-3! The Mighty Penguins Adult Intermediate Team also made it to the championship in the Tier V division and finished 2nd with a heartbreaking loss to Carolina 3-0. 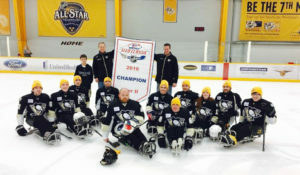 This year’s NHL Sled Classic was hosted by the Nashville Predators at the Ford Ice Center in Antioch, Tennessee and included a record 24 teams, each affiliated with an NHL club. The Mighty Penguins were proud to send both of our adult teams for the 2nd year in a row. A huge thanks to the Nashville Predators, USA Hockey Disabled Section & the NHL for sponsoring another great tournament!